Malaysia is a country with an abundant variety of tropical fruits such as durians, rambutans, mangoes, guavas, papayas, pineapples, coconuts, pomelos and many more. At any time of the year, you can get many different spread of fruits on your dining table without much hassle. Other than having the fruits as desserts or as a source of fiber for better bowel system, what would you do with them especially when you have some delicious mangoes from the plantation in Alor Setar and some juicy sweet pomelos from Tambun, Ipoh, Perak, both major exporter of their respective fruit in Malaysia? Most people would just take them as they are but for me, I’m a bit more adventurous. 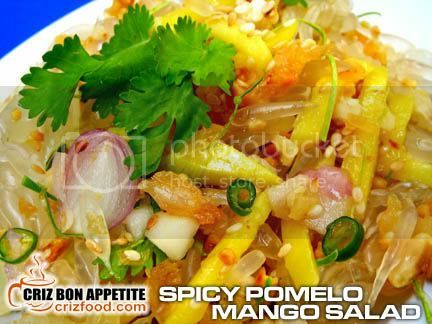 I made them into SPICY POMELO MANGO SALAD. If you are in an Asia Pacific region, getting the fresh ingredients would be quite easy. In the case of foreign countries, the best alternative would be from Chinatown or any of the Chinese grocery stores. Let us now look at the required ingredients and how easy it is to prepare this delicious salad. I have attached an animated view of the ingredients below to let you have a look on how they are cut. Leave a bit of the roasted and crushed peanuts, toasted sesame and coriander leaves as garnishes. 2. Mix the first 7 ingredients in a salad bowl, occasionally adding in a spoonful of the dressing to taste. Lastly, add in the last 3 ingredients. Please do not over stir the ingredients as it might cause the dish to be watery. 3. Garnish with the reserved items mention above. 4. Best serve while the fruits and vegetables are chilled prior to mixing. 5. Serve immediately to maintain the crunchiness of the ingredients. Note: It is not necessary to add in all the optional items but you can do so if you prefer a more spicy concoction. The bird’s eye chili (cili padi) can be replaced by any other chili pepper you would prefer as not many people can stand the hotness from this small sized fella. You can use mangoes that are slightly ripe (as I did) if you are not in for so much of sourness. Awesome! So many exotic, fresh, whole, raw ingredients. This kind of stuff is so good for you, in addition to (I’m sure) tasting as delicious as it looks. this is so colorful, healthy and a fantastic appetizer! well done!!!! Buy from restaurant cannot ar?? LOL! You should try this one day Selby. It’s great! Salivating looking your home made salad!